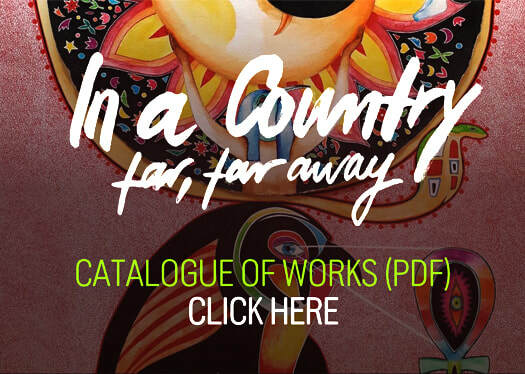 An exhibition catalogue PDF will be available on this page at the end of February. ​​​'Mishaped Pearls is the multilingual, muliticultural European-Renaissance pop project of former folk musician Ged Flood and Manuela Schütte a genuine dyed in the wool classically trained soprano. Plus an ambitiously large cast of supporting musicians playing an improbable array of instruments. No entry fee but donations are gratefully received. Gallery lights will be dimmed during the duration of the performance. 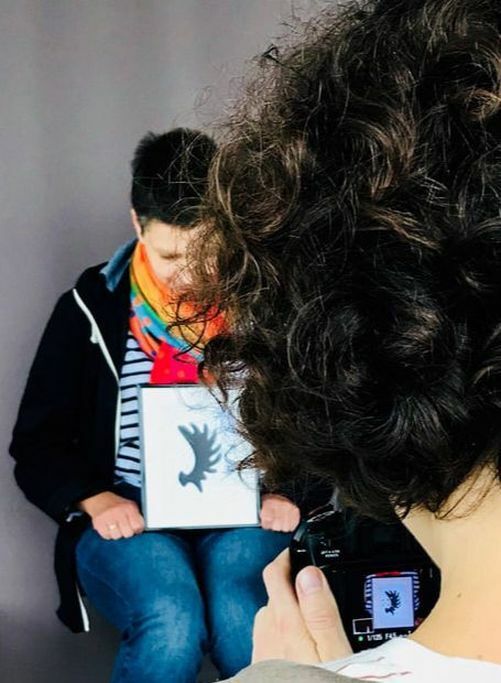 ​Film and discussion with 'Perspectives Art', an organisation of artists and volunteers supporting artists with refugee status in Athens and Lesbos. A breakfast coffee will be served. Donations are gratefully received. ​​LivingROOTS is a collaborative Project that aims to capture London's unique multicultural fabric. Stop by Judit & Beatriz's Pop Up Studio to have your portrait taken. Please bring objects that connect with you personally, emotionally, spiritually, or geographically. You are free to express yourself. Help Us Celebrate Your ROOTS! Be part of an Exhibition and a Book, and get your digital files for free. Please use the form to book a slot so we have sufficient time for a nice interview and photo session. East London Life Drawing started above a pub in Leytonstone in 2015, and has blossomed into a popular weekly gathering with a reputation for inclusiveness, creativity and varied styles. Models from from all kinds of backgrounds are invited to throw some shapes for the group, music from obscure times and places plays, and a rainbow of media is laid out and frenetically parlayed into sketches and paintings. Everything you need is provided; paper, charcoal, pencils, crayons, rubber, tape, clips, artboards, a dynamic model, and an encouraging, productive atmosphere. We’re a training ground not a talent show, and all levels of experience are welcome. We’re a mix of seasoned creative professionals, sunday painters, and people who haven’t drawn anything since high school, who all believe that your drawing only improves if you draw! Fruit and refreshments will be provided at half-time, and everyone is invited to drop in to develop their style and stretch their abilities with us! Please book your place here*, and let us know if you're planning to bring friends, so we can have enough chairs and artboards out for everyone. Our model at the Art Pavilion will be partially clothed, and the sessions will be at the special low price of £6. Can I come and draw 3 March please? Can I come and draw St 10 March please? ​​Join us for an evening of oral storytelling. Come prepared to star in your own personal soup, your heritage stew, your passion fruit salad or your bread and butter story. You will have 360 seconds to tell your tale to a captive, appreciative and generous audience. ​A beamer will be available for those who want to go to town - just bring your memory stick. We would be grateful for a donation of £3. ​Refreshments and small bites will be served. I would like to attend the event. I would like to present a story. ​Communal sculpture making weekend lead by Esther Neslen. The story of the golem originated in Germany in the 19th century, but took place in 16th century Prague. Rabbi Loew magically brought life to a human form made from mud. It was soulless and could not act independently, but was instructed to defend the Jews from anti-Semitism and pogroms. When all of the threats had been exposed and disarmed the Rabbi undid the spell and the golem returned to mud. The desire to be protected, and also to protect those in need, is a very potent force. We are going to collectively make a golem for the world, a concrete monument to protection against racism of all kinds. I am an Ashkenazi Jew, and the tale of the Golem of Prague is a common folk tale in our traditions. My family are from South Africa, Canada, Poland and Denmark but I was born in the UK. 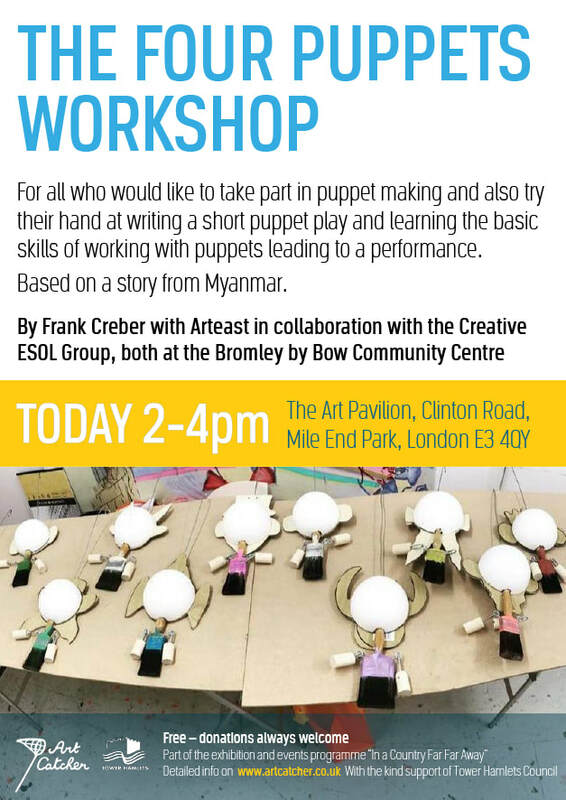 The workshop activity costs £5 per adult and £3 per child for those who can easily afford it. An artist talk by Batuhan Bintas about the role of technology and art in the evolution of human consciousness and subsequent living and storytelling. Drinks will be served. Donations box. ​​Rosy Coleman and Kiran Vaswani will be running a workshop for families based on our exhibit, "Pots of Sadness”, where the essence of the story is sharing food at times of Sadness. Participants will have the opportunity to put down their own thoughts or stories on paper, which they will then encase in clay. ​Since the theme is based around the kitchen, the heart of the home, we encourage people to bring in their own (small!) kitchen utensils, which they can mould the clay with. Whilst some pieces can be taken home to be painted later, we hope that others can be kept and added to our display. Please do not wear your best clothes! The workshop activity costs £3 per participant for those who can easily afford it. ​Nepalese animation artist Sanyukta Shrestha has collated artist made short films portraying cultures around the world. Contributions are as individual in style as the world is an inspiring place. The presentaation will include Sanyuktaa's feature film 'The Legend of Shankhadbar'. ​The film evening is £5 for those who can easily afford it. We will pass a hat around. Refreshments will be served. ​Mystery School of Sound will perform with gongs to bring you and auditory spectacle. The incredible meditative sounds will allow you to connect to your inner self. You will find yourself journeying through your inner landscape. Feel free to bring a mat if you want to lie down to relax. Free, but donations gratefully received. Sandra Arslanian (vocals/ukulele) is of Armenian origin; she was born in Beirut at the start of the Civil War and left early on with her family to Belgium, where she grew up. She returned to Lebanon many years later to participate in the country’s cultural scene. Sam Wehbi (acoustic & electric guitar) was born and raised in Beirut after the Civil War. Tigran Aleksanyan will be playing the duduk, a traditional Armenian instrument. Through sandmoon’s original songs in English and, revisited folkloric interludes & tunes (Oriental & Armenian), they will retrace their historical journey of migration from Cilicia and the Armenian Genocide in 1915, through to the Lebanese Civil War (1975-1990) and the recent unrest in the Middle East to the West. Interwoven sounds that tell a story of identity. sandmoon is an indie-pop formation originating from Beirut (Lebanon), initiated by singer/songwriter Sandra Arslanian. sandmoon’s music can be likened to the works of such Western artists as Cat Power or Kate Bush, but at the same time has a special character/color, an influence that is closely linked to the Armenian/Oriental roots of the artist. After a first demo-album “raW”, the band released an album in 2013 – “Home” and an EP - #InTheEnd in 2016; both releases received wide local and regional acclaim. In 2016, the band also wrote and performed the original soundtrack to prominent Lebanese director, Philippe Aractingi’s feature film ‘Listen’, which received the Award for Best Soundtrack at the Lebanese Movie Awards 2017. A new mini-EP “Beirut-Berlin Session” produced and mixed by renowned producer Victor Van Vugt (Nick Cave, Depeche Mode, PJ Harvey…) is being released in March 2018, featuring the single “Shiny Star”. Suggested donation of £6. We will pass a hat round.